El Macho is a tub style designed tunnel pak created for those riders who need to haul larger amounts of gear to the back country or are doing longer trips needing extra capacity. Pak integrates a vacuum formed tub that is waterproof protecting gear which needs to stay dry. Zipper top has a durable plastic insert sewn in to provide a hard top protecting items inside. Top includes a flip down integrated tunnel rack design allowing larger items to be strapped on or carried on the outside of the pak. El Macho only fits on Crossover & Long Track Mountain machines. Pak is intended to be removable once you have reached your riding destination. Pak is capable of carrying a snowboard. Pak includes a zipper compartment on the inside of the lid for the rack straps and external end pockets for extra small items. Available in colors: Black, White, Red, Yellow, & Orange. The Mini Macho is a smaller more compact version of the El Macho. It still offers the same features of a waterproof vacuum formed inner tub and a hard zipper top. 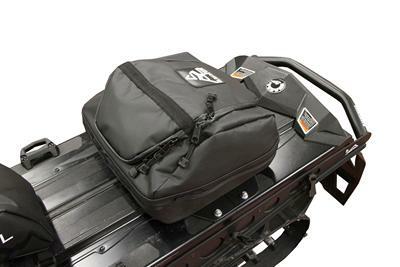 The hard top has the big aluminum D-rings on the top to strap down external storage if needed. Just like the El Macho, the Mini Macho can be removed when you get to your riding area and go ride. Great for hauling a variety of items and easily removable. 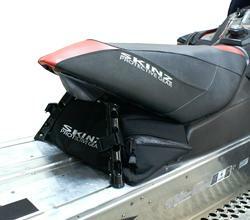 New: X-Deep Large "BLACK BOX"
See application list below to find your snowmobile with the part # & pricing info. 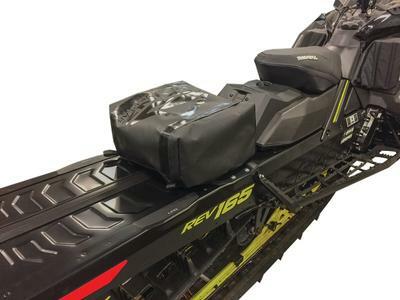 Please note: On the Rush/Rush Switchback Platforms-the only packs that will fit on these sleds are the packs specifically designed for those sleds. Our universal style packs are not advised. Also: Because of the design of the sled tunnels: Please use discretion on carrying items in pack. It is not recommended to carry items that will bounce around on tunnel. This will fit in the space under the seat between the gas tank/seat base and the seat support and will fit all models with a space of 7.5 inches between the two. Caution: Watch Exhaust with Paks.....exhaust can get hot!